Companies continue to improve shareholder communications by adding introduction/summary sections to Annual Reports (over three-quarters) and Proxy Statements (over two-thirds). Below are the results of our annual S&P 500 study done in August 2017. Companies have continued to make content easier to read and to improve shareholder communications by adding introduction/summary sections to their Annual Reports and Proxy Statements. 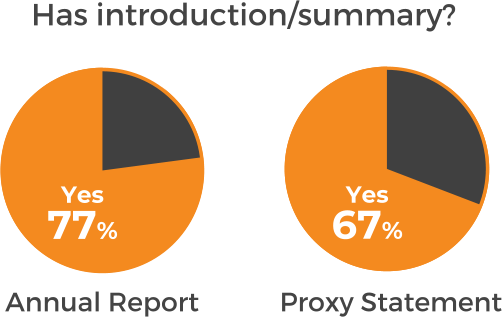 Use of Annual Report introductions grew to 77% (from 75% last year) and use of proxy summaries grew to 67% (from 61% last year). 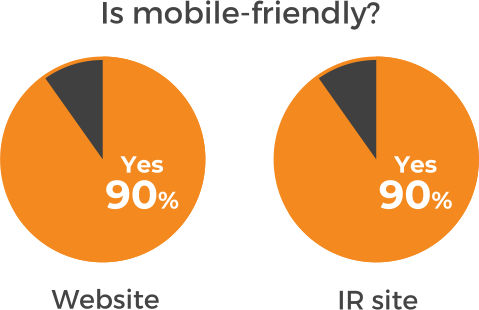 Companies have also continued to make their websites mobile-friendly (90% vs last year's 80%) and their IR websites mobile-friendly (90% vs last year's 85%), demonstrating that companies as a whole have responded well to changing user trends and the growing use of mobile devices. Although companies invest by including introduction/summary sections to make documents more readable, they still squander this work by presenting the documents in PDF format. Only 29% of online Annual Reports and 15% of online Proxy Statements were presented in a format better than PDF. PDF is still difficult to read on mobile devices (iPads, tablets, and smartphones), and built-in PDF readers on Apple devices make PDFs impossible to bookmark, cross-link, or text search. All effort to include an investor-friendly introduction in a document is lost when it is in PDF format. In order to make the most out of the effort and money spent on including introductions in Annual Reports and Proxy Statements, companies could provide a more engaging experience in their online documents with an Interactive format. 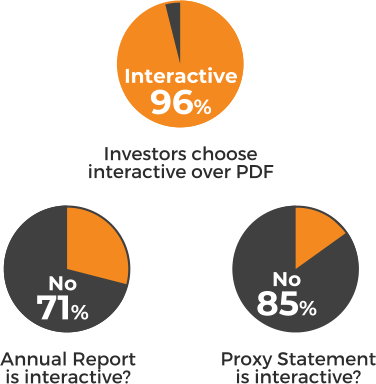 When investors are presented with both a PDF and an Interactive format of the same document, they prefer Interactive 96% of the time! The final step in making online documents Interactive is well worth the effort. Upgrading from PDF to Interactive is cost-effective and easy! The hurdle to convert your Annual Report or Proxy Statement to a format better than PDF is both inexpensive and easy to do! EZOnlineDocuments’ service is 100% hassle-free—guaranteed! Contact us today to upgrade your documents and improve your shareholder communications.